Lie-Nielson curved bottom spokeshave. Very Nice! I’ve used this spoke shave for about a year now. I really like it for sculpting the front of a seat or the leg of a chair. The edge has stayed nice and sharp. It’s easy to set the blade depth too. Very comfortable to use. I think I paid $100 and now they’re $135. That’s pretty steep but it’s a good tool. I think LN is in competition with Veritas to see who can raise the prices the fastest. I wish I would have bought more of both brands when they were cheaper. Thanks. It’s on my list. 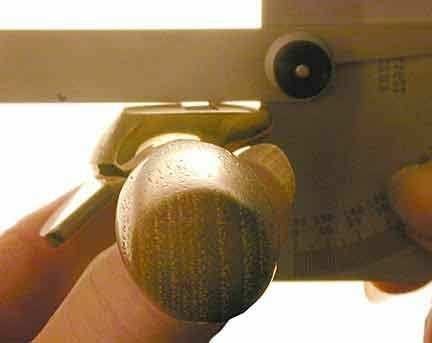 Just tried the wooden low-angle shave from James Mursell in England at Woodenspokeshave.com and am very, very impressed. I’ve never touched a tool like it. I use both the high angle Veritas shave and the low angle Mursell shave. I’m interested in trying the chair devils by Veritas. I’d like to try before I buy which is how I got the LN spokeshave. I suppose I could buy them and send them back if I don’t like them. L-N makes fabulous tools. I wish they had been around when I started woodworking back in the wagon train days. Woodworking would have been so much easier to accomplish. Glad you like your shave. I love mine. the chair devils by Veritas, are grand.